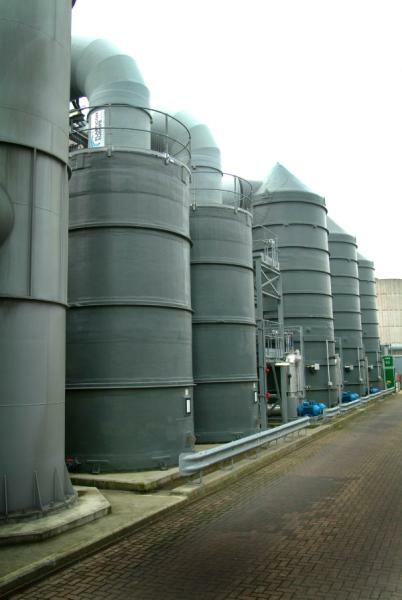 Silotanks work in the environmental field is focused on the application of mass transfer technology applied to the abatement of air and water bourne pollution using scrubbers as an air pollution control system. These systems include packed bed scrubbing and venturi scrubbing. Please contact us for details regarding our standard range of fume scrubbing systems for Sulphuric Acid, Hydrochloric Acid, Nitric Acid, Ammonia etc. Ever more rigorous legislation and increasing public anxiety have focused awareness within industry on the need to contain potentially offensive and noxious emissions. The COSHH (Control of Substances Hazardous to Health) Regulations introduced in 1989 and the requirements of the Health & Safety Executive, HM Inspectorate of Pollution and Local authorities exemplify the detailed obligations which must already be considered - and the momentum towards generally tighter monitoring and control is gathering pace.